Like many hot political topics, the issue of gun control is a big one for Christians. People are all over the place on the issue–from passionate pacifists to dedicated NRA members. Regardless of where we stand, what feels really clear is that this issue is widely debated, especially related to our faith. This month’s synchroblog addresses this hot topic, not from a government perspective but from a faith perspective. Do guns and God go together? Why or why not? How are you wrestling with this issue in your own life? How are you respecting the difference of opinion in the wider community and also honoring your own convictions about violence? 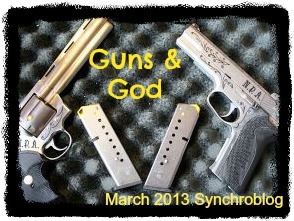 We’d love to hear your thoughts as part of March’s synchroblog. We know you might be saying “uh oh, I’m not sure if I want to say that in public for fear of controversy.” It is hard to talk about some of these big issues because the dialogue sometimes looks more like yelling. Let’s be brave and try to help create a space where people can engage in this important conversation with kindness and respect so we can learn from each other. Publish your posts by Tuesday March 12th and share your link here, and we’ll post the final link list on Wednesday morning, March 13th, to add to the bottom of your posts. If you know other bloggers who might also want to participate, feel free to pass this invitation on. All are welcome and we look forward to the diversity of posts! Here is the Link List for the February Synchroblog: Cross Gender Friendships.